The Royal Shakespeare Company’s Matilda the Musical opened in the West End over seven years ago and is still going strong today. 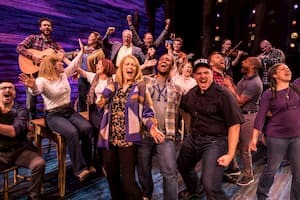 On the night I saw it at the Cambridge Theatre in London, there was a happy mixture of families, school groups, tourists and adults on their own who just enjoy a great musical. There is much in this show to appeal to people of all ages and despite the presence of so many children both on and off stage, it is a very dark tale indeed. Adapted from the book by Roald Dahl, who understood that children like scary fairy stories full of revenge and violence, the musical makes a bold statement about the strength and resilience of children. Matilda may be misunderstood and unloved by her family but still manages to triumph through sheer willpower. Matilda is the black sheep of the Wormwood family, a highly intelligent girl who despite just starting school has already read Dostoevsky and Dickens. Her mother is far more interested in her competitive dancing partner Rudolpho than in her children. Mr Wormwood is busy scamming Russians in a faulty used car deal and wishes Matilda were more like her TV watching couch potato brother Michael, who can only speak in one word utterances. Matilda feels more at home in the library where she tells stories to the warm-hearted librarian, Mrs Phelps. As if her life couldn’t get any worse, her father enrols her in Crunchem Hall run by the fierce Miss Trunchbull who delights in calling children maggots and hanging them by their ears. Her abusive behaviour is constant, yet little Matilda somehow keeps finding the courage to stand up to this harridan because her punishments “are not fair!”. It is Matilda’s sense of justice which leads her to rebel and discover within herself mysterious powers which bring about the evil Miss Trunchbull’s downfall. Aside from Mrs Phelps, the only adult who believes in and appreciates Matilda is the lovely Miss Honey who, despite her kindness is too meek to be of much help. In this story, the children are the only ones brave enough to make a difference and kindness is not going to cut it with the likes of Miss Trunchbull. Unlike more contemporary children’s authors, Roald Dahl didn’t bother to look for psychological reasons why people are horrible, they just are. The only way to defeat them is with a strong sense of morality and a lot of pluck. Dahl revelled in showing the wicked, silly and stupid getting their comeuppance and many of his tales are revenge stories. 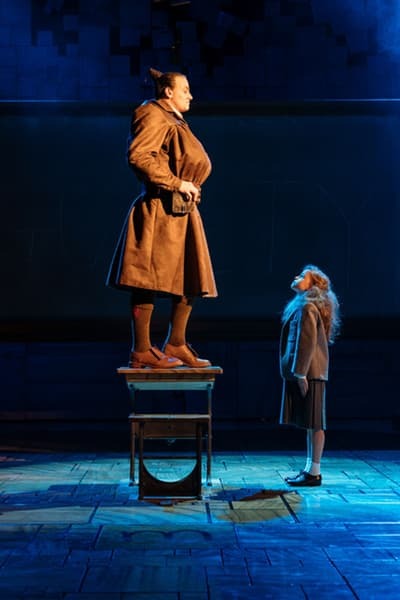 In Matilda the Musical the baddies, Mr and Mrs Wormwood and Miss Trunchbull are cruel yet ridiculous figures, wildly entertaining in their outrageousness. Matilda’s parents scream and shout at her because they don’t understand her intelligence and find it a bit scary. They are cartoon characters who are too self-involved to notice their younger child is exceptional, seeing instead a threat to everything they know and love. A metaphor for our times? The book by Dennis Kelly is brilliantly funny, full of witty dialogue but enough pathos to bring tears to your eyes at the end. 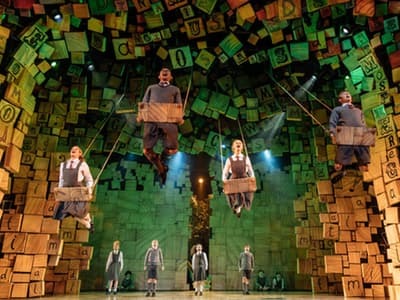 The changes to the original story, such as Matilda’s ability to make up involving stories which turn out to be true, work well for the stage. Tim Minchin’s music and lyrics are all one would expect from this extraordinary comedian, full of surprising twists and turns. He has said Roald Dahl’s Revolting Rhymes were a great influence on his own work so this project was a dream job for him. In the first number, Miracle, where each child sings about the love they receive from their overly doting parents “My mummy says I’m a miracle!” poor Matilda sings “My mum says I’m a good case for population control”. It was difficult to catch all the lyrics in the group numbers which is a good reason to buy a cast album. The performances are first-rate. 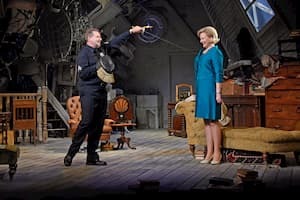 Haydn Tee is hilarious as Miss Trunchbull who seems to truly believe that all children are horrible creatures out to get her and make her life a misery. She is in many ways a panto villain, so will make children laugh as much as she frightens them. Holly Dale Spencer and Rob Compton as the Wormwoods were also very enjoyable. I especially liked the father’s ode to television, Telly, which opened the second act. Malinda Parris as Mrs Phelps and Gina Beck as Miss Honey lent the production much needed warmth and sweetness. In the performance I attended, Olivia Wells played Matilda with just the right amount of determination and spirit to make her a complex character. She is not the loveable angel of so many children’s stories but a wilful, clever child who gives almost as good as she gets. All of the children were exceptional performers, Sadie Victoria Lim as Lavender and Archie Lewis as Bruce Bogtrotter were stand outs. This is a show which is perfect for the entire family and deserves to be seen several times. It is currently touring the world as well as the UK, so wherever you are you have no excuse to not catch Matilda the Musical. 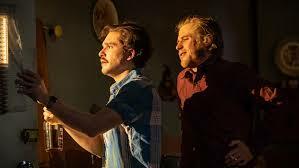 After the excellent revival of Buried Child in 2016, it is heartening to see yet another Sam Shephard classic, True West, in the West End. This play, written in 1980, was apparently a box office failure when it debuted at the Public Theatre in New York. It only became a long running hit when staged with John Malkovich and Gary Sinise as warring brothers Lee and Austin. It is understandable as these two demanding roles need to be cast just right in this tricky work which veers wildly from kitchen sink realism to Beckettian absurdism. Johnny Flynn is perfectly comfortable in his role as the ne’re- do-well Lee, who, when he isn’t stealing TV’s from the neighbours is running dog fights to make a fast buck. At first glance Kit Harington, Jon Snow from Game of Thrones, may not seem ideal as the hardworking, studious screenwriter Austin. However, from the opening scene of this production he is virtually unrecognisable in his slicked back hair and aviator glasses, diligently typing away by candle light. I am happy to say both actors hold their own and have a fiery chemistry between them as well as great comic rapport. Austin has come to stay in his mother’s house while she is in Alaska, needing some quiet time alone to work on his latest screenplay. 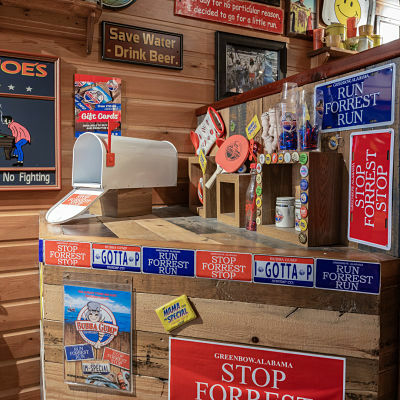 The appearance of his beer swilling older brother Lee, whom he hasn’t seen in five years, is more an annoyance than a surprise, despite Lee’s frequent physical threats, which he seems to take in his stride. Not much ruffles Austin’s feathers until Lee walks in on an important meeting he has set up with Hollywood producer Saul Kimmer and proceeds to hijack it, arranging an early morning golf game and pitching his own idea for a movie. Amazingly the producer likes Lee’s idea, a strange western, which Lee asks Austin to write up as an outline. Although Austin is initially happy to help, thinking Lee will finally stop burglarising the neighbourhood, he is furious when Saul says he prefers Lee’s idea, has sold it to a studio and secured a large advance. By the second act, the tables have turned. The celebration champagne is gone and Austin is now blind drunk, swigging from a whiskey bottle. Lee works furiously at a typewriter that he pulls apart while trying to fix. He cannot put his words down and is getting increasingly frustrated. A hilarious scene in which Austin makes toast in a line-up of many toasters he has just stolen and then proceeds to butter each one, leads not into peace between the brothers but more competitive fighting which escalates in a nasty turn of events. This play, like most of Shephard’s work, goes in unpredictable directions, keeping the audience constantly guessing. The play is almost over before Madeleine Potter makes an appearance as the mother, newly returned from her holiday to complete chaos. There have been several productions of True West where the actors playing the brothers have alternated the roles during the run. Although that is not the case here, it is clear that they are meant to be two aspects of the same person, perhaps even of Shephard himself; the hard-working intellectual vying with the wild renegade who is prone to disappearing into the desert. Kit Harington is a revelation as Austin, a role which was clearly a challenge as the character goes through drastic changes. He is a fine actor and deserves to take on more great stage roles. Johnny Flynn has already made a name for himself in the West End in Martin McDonagh’s Hangmen, also directed by the talented Matthew Dunster, where he played another menacing trickster. Here he brilliantly inhabits Lee completely, bodily taking up space as he prowls about the house, looming intimidatingly over his brother and yet reigning in his volatility to manipulate and charm the Hollywood producer. Flynn, who also composed the music for this production and is a singer/songwriter, is clearly a force to be reckoned with. Donald Sage Mackay, an American actor who recently moved to the UK, is excellent as the amiable Saul as is Madeleine Potter who makes the most of a small but striking role as Mom. In her detached befuddlement and complete lack of caring for her grown children she makes it clear why her sons turned out as they did. This exciting production runs only until 23 February so catch it while you can. It will probably sell out just on its star power to Game of Thrones fans but is an enervating evening at the theatre for admirers of this great American playwright.